SEE HOW MEN DENY THE TRUTH OF THESE CALLS OF MINE, WITH THE AIM OF PUTTING A MASK OF GOODNESS ON THE ACCEPTANCE THAT THEY GRANT TO MODERN TRENDS, DUE TO THE MISCONDUCT OF SOME OF MY CONSECRATED, WITH WHICH I AM BETRAYED TOGETHER WITH MY PEOPLE!" With His Divinity and Splendor, in union with Our Blessed Mother, Our Lord appears standing with His Scepter, on which I distinguish a sphere representing the Earth and from which two rings emerge, and from them a thick spike that Our Lord holds firmly with His Hand. Inconceivable beauty of Our Lord who, with His natural Love, looks at me with His magnetic, honey-colored eyes. Our Mother, of a beauty without equal, by Her Son's side, listens to Him with great solemnity. 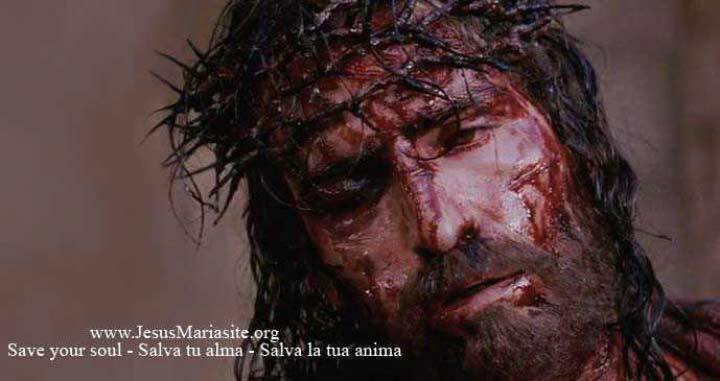 "MY BELOVED, SEE HOW I AM BETRAYED BY SOME OF THOSE WHO HAVE PROMISED TO LOVE ME ABOVE ALL THINGS AND WHO AT THIS INSTANT REJECT ME, ACCEPTING THE LICENTIOUSNESS THAT THE DEVIL OFFERS THEM. Transforming themselves into enemies of My Love, they fight against what is Divine and obscure it by pretending to serve Me in order to confuse My People. They accept the will of the devil and deny My Will, intoxicated by the devil's evil; pride predominates in those who have forgotten Me - they walk in great ignorance, but debate My Truth with infernal arguments in order to show the "earthly power" that is leading them to perdition. THE DEMONS HAVE POUNCED ON HUMANITY IN ORDER TO INJECT IT WITH GREED FOR WHAT IS MINE, POISONING YOU. YOU THINK THAT YOU KNOW EVERYTHING, FORGETTING THAT "I AM WHO I AM", (Ex 3,14) AND THAT BEFORE ME YOU WILL HAVE TO REMAIN SILENT. My child, how many of My own are falling into evil due to the desire to have everything and slandering one another in their search of power in front of their brothers and sisters! “Just as it was in the days of Noah, so too it will be in the days of the Son of Man. They were eating and drinking, and marrying and being given in marriage, until the day Noah entered the ark, and the flood came and destroyed all of them. Likewise, just as it was in the days of Lot: they were eating and drinking, buying and selling, planting and building, but on the day that Lot left Sodom, it rained fire and sulphur from heaven and destroyed all of them—it will be like that on the day that the Son of Man is revealed.” (Lk 17, 26-30). THE PERSECUTION OF MY CHURCH IS INCREASING; you are not yet experiencing it in a generalized way, although that day is approaching when those who have emigrated to other countries throughout the world will take possession of the headquarters of My Church, and the latter will have to be moved to another country - not before the martyrs of this instant bathe the earth with their blood, especially Rome. WHERE ARE MY CHILDREN? WHERE MY PEOPLE? WHERE ARE THOSE WHO WANT TO FULFILL THE DIVINE LAW FAITHFULLY, THOSE WHO TRULY WANT TO GROW IN MY LOVE? BECAUSE I SEE MY OWN LIVING WITHOUT LOVE, FIGHTING AGAINST ONE ANOTHER, CONSTANTLY ATTACKING EACH OTHER. Where are My faithful when I do not find peace among men? They lie to one another, they betray one another, and like birds of prey they tear each other to pieces. This is what I see in My People: unease, disrespect, intolerance and above all arrogance, which is leading My children to the precipice. HOMES ARE NOT PEACEFUL, BUT INSTEAD THEY HAVE BEEN CHANGED INTO HOSTELS WHERE STRANGERS SPENDING THE NIGHT LIVE TOGETHER. Few are the homes where the truth of love and respect reigns. Parents do not have authority over children. Parents, a surprising number of them, maintain a double life, they falsely live out a deceptive appearance. I WHO SEE THEM AND KNOW THEM SHUDDER AT THE FALSEHOOD TO WHICH MAN HAS SUCCUMBED. Humanity's desires of the flesh exceed purposes of amendment. Humanity is not aware of how dangerous it is to lose the soul, submitting to the inordinate desires of the flesh: I see men living with several women, satisfying instincts detestable before Me, I see men with men and women with women. This way of living, detestable to My Eyes, will be reduced by a new disease that spreads silently and for which there is no cure, only solitude in order not to infect those around them. Humanity shows solidarity in sinning, solidarity in offending me, solidarity in becoming drunk on the snares of the devil who is astutely preparing the public appearance of the antichrist. Woe unto those who have set me aside in order to follow men who err, men who think they know Me yet who do not know Me deeply because they are conditioned by leadership within My Church! I therefore summon My People of all nations, those who love Me above all things, those who strive for conversion, those who trust in Me, those who open their hearts to Me so that they do not allow themselves to be contaminated by the darkness of evil. And for this, call on My Mother with confidence: “HAIL MARY MOST PURE, CONCEIVED WITHOUT SIN". HOW MANY OF MY CHILDREN RECEIVE ME IMPROPERLY! I AM CONFUSED WITH CHEWING GUM IN THEIR MOUTHS AND THEN THROWN DOWN ON THE GROUND WITHOUT ANY AWARENESS. RECEIVE ME PROPERLY PREPARED, IN ORDER THAT YOU MAY RESIST, BUT ABOVE ALL, DO NOT MAKE ME SUFFER PAIN AFTER RECEIVING ME IF YOU ARE NOT WILLING TO LIVE WITHOUT OFFENDING ME. MY BODY AND MY BLOOD DO NOT REMAIN ONLY DURING COMMUNION, BUT I LIVE IN EACH ONE OF YOU OVER TIME. Pray, My children, pray for Argentina, land of disputes and calamities engineered by man. Pray My children, pray for the United States, it continues suffering through Nature and from within. Pray My children, pray for Russia, it surprises the world. Pray for Guatemala, the wrath of its volcanoes hangs over it. Pray for one another, pray and minister to one another. I bless you from My Most Sacred Heart. I call you to save your soul ... now!